Three young frogs, who were as yet unwise about the ways of the world, were out one day exploring their environment. They came to a dairy farm and entered the barn. finding a pail half filled with fresh milk. Not knowing what it was, and being a little too curious and somewhat careless, two of them jumped right into it. Splash! As they swam about attempting to reach the top of the pail, they found that the sides of the pail were too high and steep to reach. The third frog, being more timid, only jumped onto the top rim of the bucket. He looked down at his two comrades struggling below to jump out of a white substance. After some failed attempts, he shouted down to them, "You’ll never make it. Face facts and prepare to die!" But since self-preservation is the first rule of life for humans and animals alike, they continued to struggle for as long as possible. The frog on top continued to shout down, “You’ll never make it. Give up and die peacefully.” Unfortunately, one of the two struggling frogs did not continue and disappeared below the surface never to be seen again. 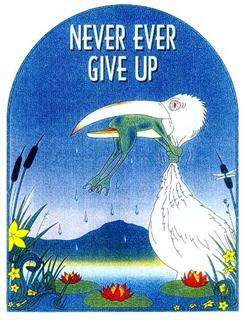 The one remaining frog was determined not to give up, and he continued to struggle despite the discouragement of his comrade on top of the bucket. He kicked and squirmed and kicked and squirmed until, at last, all his churning about in the milk had turned the cream on top into a big hunk of butter, which was solid enough for him to climb onto and get out of the pail! When rejoined by his comrade, he thanked him profusely for all the encouragement he shouted down to him. He would never have made it without his help. The frog who survived was deaf. A group of frogs were hopping contentedly through the woods, going about their froggy business, when two of them fell into a deep pit. The other frogs gathered around the pit to see what could be done to help their companions. When they saw how deep the pit was, the rest of the dismayed group agreed that it was hopeless and told the two unfortunate frogs in the pit that they should prepare themselves for their fate, because they were as good as dead. Unwilling to accept this terrible fate, the two frogs tried with all of their might to jump out of the pit. 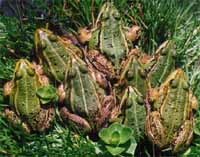 The other frogs shouted into the pit that it was hopeless, and that they wouldn't be in that situation if they had been more careful, more obedient to the froggy rules, and more responsible. They continued shouting that they should save their energy and give up, since they were already as good as dead. But the two frogs continued jumping as hard as they could and became quite weary. Finally, one of the frogs took heed to the calls of his fellows. Spent and disheartened, he quietly resolved himself to his fate, lay down at the bottom of the pit, and died as the others looked on in helpless grief. Reading their lips, the astonished frog explained to them that he was deaf, and that when he saw their gestures and shouting, he thought they were cheering him on. What he had perceived as encouragement inspired him to try harder and to succeed against all odds. There once was a bunch of tiny frogs who arranged a climbing competition. The goal was to reach the top of a very high tower. A big crowd had gathered around the tower to see the race and cheer on the contestants. The race began. No one in the crowd really believed the tiny frogs would reach the top of the tower. More tiny frogs got tired and gave up. But ONE continued to climb higher and higher. This one refused to give up! At the end of the race, all had given up climbing the tower except for the one tiny frog who, after a big effort, was the only one who reached the top! All of the other tiny frogs wanted to know how this one frog managed to do it. They asked him how he had found the strength to succeed and reach the goal. It turned out that the winning frog was DEAF!!!! Never give up, encourage others to do the same, and never discourage others. There is enormous power in words. Your encouraging words can lift someone up and help him or her make it through the day. Remember that encouraging words can go a long way. Always be aware of the power words have, because everything you hear and read will affect your actions. Be careful of what you say to others, and never listen to the negative comments or pessimism of others because they could cause you to give up and discontinue pursuing your goal. Never use destructive, careless words to others, especially to someone who is down. Those words can cause deep wounds; they may be the weapons that destroy someone's desire to continue trying. Your unkind words can also diminish someone in the eyes of others, destroy their influence, and have a lasting impact on the way others respond to them. Anyone can speak words that tend to rob another of the spirit to continue in difficult times. But it is a special individual who will take the time to encourage another. Be special to others. Encourage one another and build each other up. It's been said that if you put a frog into a pot of boiling water, it will leap out right away to escape the danger. But if you put a frog in a kettle that is filled with water that is cool and pleasant, and then you gradually heat the kettle until it starts boiling, the frog will not become aware of the threat until it is too late. The frog's survival instincts are geared towards detecting sudden changes. This is an anecdote that is used to illustrate how people might get themselves into terrible trouble. It's a warning to keep us paying attention not just to obvious threats but to more slowly developing ones. It's also often used to illustrate how humans have to be careful to watch slowly changing trends in the environment, not just the sudden changes. Is this anecdote true? Not according to Dr. Victor Hutchison, a Research Professor Emeritus from the University of Oklahoma's Department of Zoology, who says, “The legend is entirely incorrect!"